WE HAVE TO START AT THE BEGINNING, and in the context of Genesis the fundamental affirmation which any Christian must make is that the world in which we live is God’s world. He created it and he created us. We bear an integral relationship to the material world and it is because of this that the business of creating and using wealth is a natural activity for mankind. Life itself demands that we be continually involved in the process of wealth creation. The basic necessities for living are not provided like manna; the land has to be cultivated, the sea has to be harvested, minerals have to be extracted, the city has to be supplied with services. God created us with the capacity and the desire to do all these things. Life itself, therefore, demands that we use what God has given us to provide the necessities. But God intended far more than that. We were not created to live our lives in hunger or on the breadline, in a state of poverty using only the barest minimum. God intended us to enjoy his world. The land which he promised Israel was to be flowing with milk and honey. No Christian should feel a sense of guilt from living in a decent house, driving a solid car, wearing a proper suit of clothes or eating a good meal. If we take seriously the fact that this world is God’s world, then the business of creating wealth has a Christian foundation. But to allow wealth creation legitimacy is not to endow it with autonomy. To allow economic life independence and place no bounds on wealth creation would be to justify a philosophy of materialism. For the world which God created is a spiritual world as well as a material world. God is a spirit, and being created in his image we are possessed of spirit as well. Being made, therefore, from the dust of the earth but endowed with spirit, we are to pursue our lives in a material world, yet in the context of a spiritual order . . . . The call to seek first the Kingdom of God is not a call to the life of the monastery or to a narrow-minded form of personal piety which rejects the material world. We are to seek God and live by the laws of his Kingdom within the material world which he has created and of which we are part. The challenge for the Christian then is not to reject the material world and the creation of wealth in favour of some higher spiritual priority but to serve others through the process of wealth creation in the perspective of serving God. The basic argument for a market economy in moral terms is that with all its weaknesses it is a system which pays respect to human dignity because it allows human freedom. It permits individuals the freedom to buy and sell, save and invest, choose their preferred form of employment, and develop the skills which they feel appropriate. It allows minorities exactly these same rights too. Socialism does not. It pays scant respect to human dignity because it denies human freedom. It for ever restricts economic freedoms. Both systems have been put to the test and we can examine the record. It is vital that in this matter fact should be compared with fact, and ideal with ideal, It is wrong to judge the facts of capitalism with the ideals of socialism, much as it is wrong to judge the facts of socialism with the ideals of capitalism. When we look at the facts, what we observe in one country after another is that when politicians believe (with Rousseau) that people are born free but are everywhere in chains because of circumstances— and correct this by creating a socialist utopia—the vesting of property rights in the state leads to a loss of personal freedoms, the direction of investment, the direction of labour and a totalitarian state. Taken from The Creation of Wealth by Brian Griffiths. 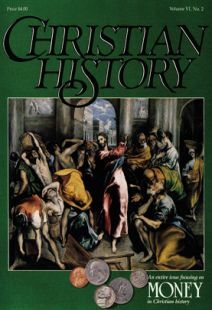 Copyright 1984 by Brian Griffiths and used by permission of InterVarsity Press. Does debt rest on covetousness? Who was who in Augustine’ world. Augustine’s timeless classic about the timeless city. Augustine on teachers and teaching.